Recently, we attended a workshop on Storytelling with Michael Davis, the Storytelling MD, and creator of speakingcpr.com. He encouraged us that we all have the gift of public speaking, and it’s not a matter of being born with the ability or not. So why is storytelling so much more efficient in writing and public speaking? Telling stories creates an emotional connection with our audience to what we’re trying to say. It allows people to tap into our world and transports them into their own experiences. Storytelling can be a great way to share your why and mission of what you do. If you don’t know your why, chances are your business isn’t functioning as well as it should. Who’s the Character? This might be obvious…the cute baby. What’s the Goal? 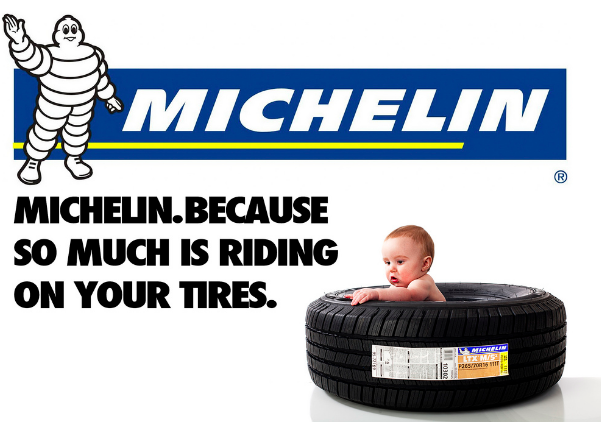 You’re a better parent if you have Michelin tires because you’ll keep your kids safe. What’s the Obstacle? There are many tires to choose from, but Michelin is wanting you to know they’ll keep you the safest on the road. Making your story a conversation through dialogue brings your story to life. Never memorize a story – just have the general concept of what you want to say and always make sure the emotional experience of your story is true. Characters: every story needs a hero and a guru. The hero is someone with objectives but the guru provides wisdom and advice. You or your company should never be both. Circumstances: this is where sensory details and answering the five W’s will be the most useful. Conflict: explain the character’s internal and external conflict for the audience to connect with. Cure: this is the moment when the hero gets wisdom from the guru and makes a change for the better. Carryout Message: this is the main take away. Keep it less than 10 words and straight to the point. Be blunt! Conversations: Use dialogue between characters to bring the story to life. Now go back and look at the Michelin ad. Can you name all of the 7 C’s that they address in the ad? Pay close attention to how people are reacting to your stories. Entice their curiosity and leave them wanting to hear more of what you have to say. The first version may not be the best, but the most important thing is that you get out and tell your story!